Our time is precious. And i firmly believe that it has to be utilized and invested on with extreme discretion. Given this as a new author, i need to be sensitive about my readers doubt. And so whoever decides to invest their time on my book, i need to give that reader a benefit of cost that they may be investing. With this thought I am running a campaign on Amazon for this weekend, whereby my ebook can be downloaded for no cost. The campaign will last only till 8 am , 28.4.14 (pacific time). My objective is to introduce myself to a host of intelligent readers and start a dialogue with them. 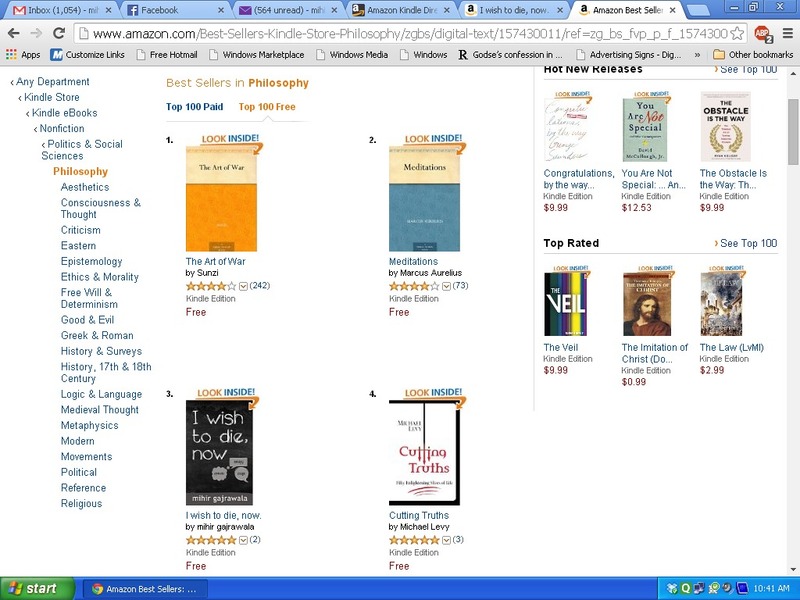 And i am so delighted that in less than 24 hours of campaign being initiated, my title “I wish to die, now” is ranked #3 under the philosophy section of Kindle books collection. I promise to make my relationship with my reader more and more enriching in times to come.